Living Legend Sachin Tendulkar - A site from a die hard Sachin Tendulkar Fan: Did you know ? 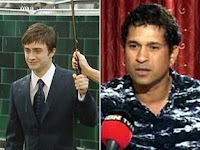 Daniel Radcliffe - Harry Potter star took Tendulkar's autograph at Lord's on his 18th birthday in 2007. But so engrossed was Sachin in obliging his fans that he didn't even notice signing up for Daniel. "I first met him when we were touring England in 2007. After the Lord's Test, we drove down to Nottingham for the second Test and it was there that I got a call from my wife, Anjali, who asked me about my meeting with Harry Potter. I said, no, I haven't met him. But she insisted I did because the statement had come from Daniel himself that he got his best birthday present. As it turned out, just before the day's play at Lord's, I was obliging fans on my way back to the dressing room. And when you sign autographs you aren't always looking up at the person. So I missed the opportunity to meet him and say hello to him then. However, this time around I met him at Lord's during the T20 World Cup and I got a chance to say hello to him."